RACH stands for Random Access Channel. This is the first message from UE to eNB when you power it on. Even though they use a little bit different name, in all cellular technology (CDMA, GSM, WCDMA, LTE) there is a specific signal that perform the same function. In CDMA, they call it 'Access Probe' as far as I know (but I don't have much knowledge on CDMA), in GSM they call it 'Channel Request', and in WCDMA / LTE they call it 'RACH'. In terms of eNB point of view, it would seem that it is getting this initial UE signal in almost random fashion (e.g, in Random timing , Random Frequency and in Random Identification) because it has no idea when a user turn on the UE (Actually it is not completely random, there are a certain range of agreement between UE and Network about the timing, frequency location and possible indentification, but in large scale it would look like working in random fashion). In terms of Radio Access Network implementation, handling RACH would be one of the most challenging job. Even in terms of protocol design, RACH design can be one of the most important / critical portions. If you have any experience of testing UE or UE modem chipset at the very early stage of the development, you would have noticed that RACH is the most challenging point in terms of troubleshooting. Why ? Before UE decided to send RACH signal (RACH preamble), there are many preconditions to be met as described in From Power-On to PRACH. If there are some problems in precondion stage, you have to completely rely on UE side log only, Network side log does not help anything. Even though you have access to the UE side log, depending on UE modem chipset.. some provides pretty detailed information but others does not provide much detailed information. Even if the UE log provides the detailed information, there are not many people who can properly interpret those information and find out the root cause of the problem. You would see a lot of issues and spend many many stressful days when you are testing the device at its early stage of the implementation, but once the device / modem is mature you would even forget about the fact that there is such a step called 'RACH' because this wouldn't cause any trouble. Anyway... in short. RACH is one of the most important steps in LTE protocol (actually in any Cellular protocol) and there are a lot of details to be covered as below. When RACH Process occurs ? How the information is encoded into PRACH (RACH Preamble) ? Exactly when and Where a UE transmit RACH ? What is preamble format ? Why Multiple Preamble Format ? How to determined which Preamble format to use ? How does Network knows exactly when UE will transmit the RACH ? How many RA-Preambles can be used ? How to Generate 64 PRACH Preamble Sequences ? How to generate RACH Signal ? How is the RACH Preamble Power determined ? How can we get RA RNTI ? The first question poping up in your mind when you first hear about the word RACH or RACH Process would be 'Why RACH ? ', 'What is the functionality/purpose of RACH process ? ', "Why we need this kind of complicated (looks over-complicated) ?'. For sure, it is not for confusing you :), RACH has very important functionality especially in LTE (and in WCDMA as well). The main purpose of RACH can be described as follows. In most of the communication (especially digital comunication regardless of whether it is wired or wireless), the most important precondition is to establish the timing synchronization between the reciever and transmitter. So whatever communication technology you would study, you would see some kind of synchronization mechanism that is specially designed for the specific communication. In LTE (in WCDMA as well), the synchronization in downlink (Transmitter = eNB, Reciever = UE), this synchronization is achieved by the special synchronization channel (special physical signal pattern). Refer to Time Sync Process page for the details. This downlink sync signal gets broadcasted to everybody and it is get transmitted all the time with a certain interval. All the complicated/confusing stories in this page is mostly about the process specially designed mechanism to meet these criteria. Another purpose of RACH process is to obtain the resource for Msg3 (Message 3). RRC Connection Request is one example of Msg3 and there are several different types of Msg3 depending on situation. You would figure out this part in reading through this page and this is not very complicated to understand. It would be helpful to understand if you think about when 'RRC Connection' happens (or when PRACH process happens if you are interested in lower layer stuffs) in WCDMA. It would also be helpful if you think about when 'Channel Request' happens in GSM UE. E.g. when UL synchronisation status is "non-synchronised" or there are no PUCCH resources for SR available. When a UE transmit a PRACH Preamble, it transmits with a specific pattern and this specific pattern is called a "Signature". In each LTE cell, total 64 preamble signatures are available and UE select randomly one of these signatures. UE select "Randomly" one of these signatures ? Does this mean that there is some possibility that multiple UEs send PRACH with identical signatures ? There is such a possibility. It means the same PRACH preamble from multipe UE reaches the NW at the same time.. this kind of PRACH collision is called "Contention" and the RACH process that allows this type of "Contention" is called "Contention based" RACH Process. In this kind of contention based RACH process, Network would go through additional process at later step to resolve these contention and this process is called "Contention Resolution" step. But there is some cases that these kind of contention is not acceptable due to some reason (e.g, timing restriction) and these contention can be prevented. Usually in this case, the Network informs each of the UE of exactly when and which preamble signature it has to use. Of course, in this case Network will allocate these preamble signature so that it would not collide. This kind of RACH process is called "Contention Free" RACH procedure. To initiate the "Contention Free" RACH process, UE should be in Connected Mode before the RACH process as in Handover case. Now let's assume that a contention happened at step i). For example, two UEs sent PRACH. In this case, both of the UE will recieve the same T_C-RNTI and resource allocation at step ii). And as a result, both UE would send L2/L3 message through the same resource allocation(meaning with the same time/frequency location) to NW at step iii). What would happen when both UE transmit the exact same information on the exact same time/frequency location ? One possibility is that these two signal act as interference to each other and NW decode neither of them. In this case, none of the UE would have any response (HARQ ACK) from NW and they all think that RACH process has failed and go back to step i). The other possibility would be that NW could successfully decode the message from only one UE and failed to decode it from the other UE. In this case, the UE with the successful L2/L3 decoding on NW side will get the HARQ ACK from Network. This HARQ ACK process for step iii) message is called "contention resolution" process. In LTE, all the information (data) after PRACH Preamble has its own binary structure meaning that they are translated into a certain data structure. However, the information in PRACH Preamble is represented by purely physical properties. The physical properties that forms the information in PRACH are as follows. From item i) and ii), RA_RNTI is deribed as described in How can we get RA RNTI . From item iii), Preamble Index (RAPID) can be derived. To answer to this question, you need to refer to 3GPP specification TS36.211 - Table 5.7.1-2. This table would give you at which frame and subframe that UE is allowed to transmit a PRACH Preamble. 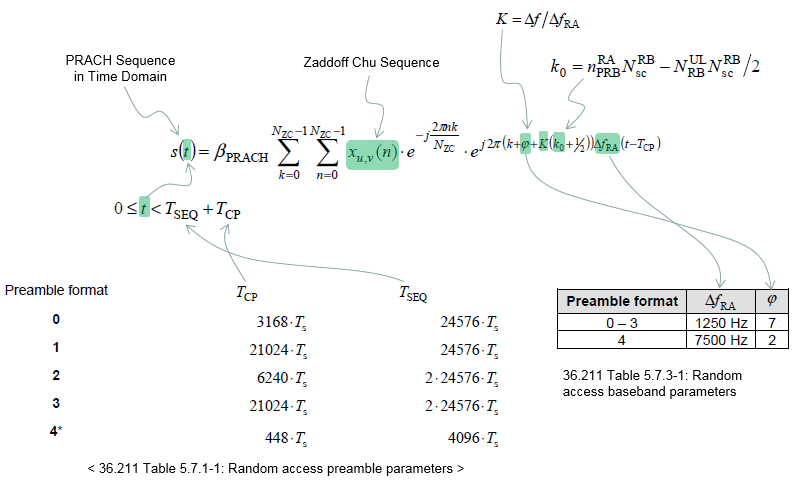 As you see at this table, the prach preamble timing and prach preamble type is determined by PRACH Configuration Index. 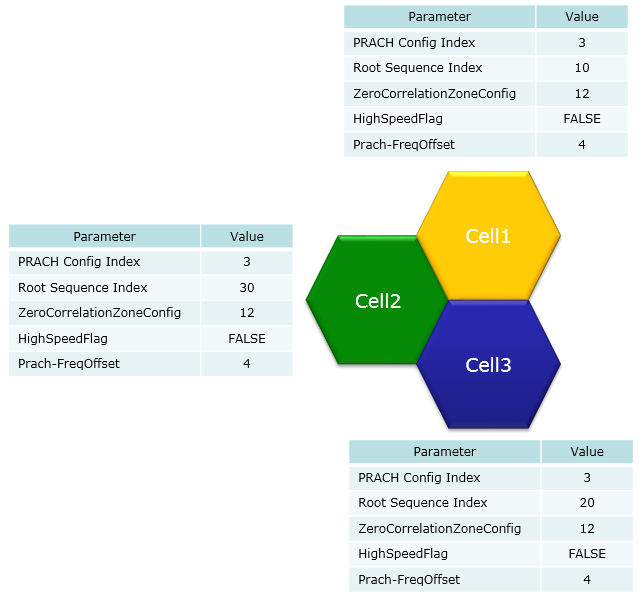 The, how PRACH Configuration Index is determined ? It is determined by SIB2 parameter prach-ConfigIndex. Did you open the specification now ? 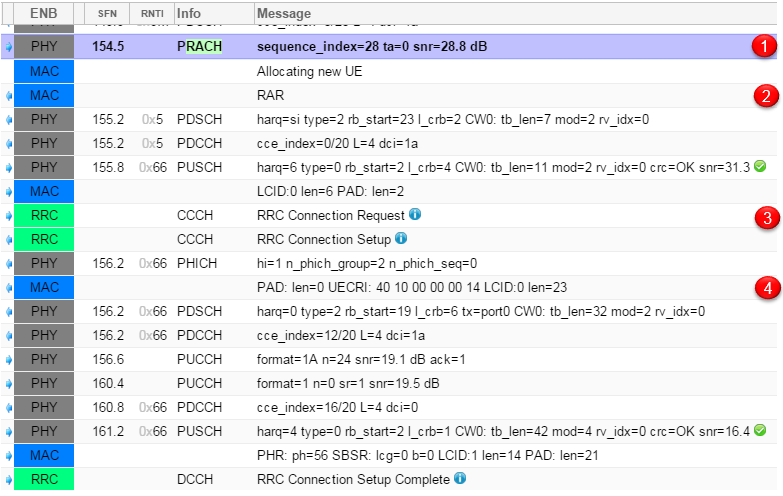 It shows exactly when a UE is supposed to send RACH depending on a parameter called "PRACH Configuration Index". For example, if the UE is using "PRACH Configuration Idex 0", it should transmit the RACH only in EVEN number SFN(System Frame Number). Is this good enough answer ? Does this mean that this UE can transmit the RACH in any time within the specified the SFN ? The answer to this question is in "Sub Frame Number" colulmn of the table. It says "1" for "PRACH Configuration Idex 0". It means the UE is allowed to transmit RACH only at sub frame number 1 of every even SFN. Checking your understanding of the table, I will give you one question. With which "PRACH Configuration Idex", it would be the easiest for the Network to detect the RACH from UE ? and Why ? The answer would be 14, because UE can send the RACH in any SFN and any slots within the frame. In a big picture, you should know all the dimmensions in the following diagram. (The Red rectangle is PRACH signal). If you see the 36.211- table 5.7.1-1 show above, you see the column titled as "Preamble Format". What is the preamble format ? It is defined as following diagram. You would see that the length of PRACH preamble varies depending on the preamble format. For example, the length of PRACH with preamble format 0 is (3186 + 24567) Samples. (As you know, one sample (Ts) is 1/30.72 (=0.03255) us. It is defined as 1/(15000 x 2048) seconds (=0.03255 us) in 36.211 4 Frame structure). You may ask "Why we need this kind of multiple preamble format ? ", especially "Why we need various PRACH format with different length in time ?". First try to figure out what is the difference among preamble format based on the table above (Table 5.7.1-1) ? For simplicity, let's think of only format 0,1,2,3. Let's look into T_SEQ (length of Sequence). You see format 0 and format 1 is made up of single copies of PRACH converted in time domain. Format 2 and 3 is made up of two copies of PRACH sequence concatenated. What would be the advantage that format 2,3 have over format 1,2. I think the longer T_SEQ would help decoding PRACH under noised condition because it provide longer correlation window to detect PRACH. Now let's look at T_CP part. you would notice format 1 and 3 has much longer T_CP comparing to format 0 and 2. Longer CP would give you better tolerance in fading environment and reducing ISI even in highly fading environment. I want to recommend a book titled "LTE : The UMTS From Theory to Practice" Section 19.4.2 The PRACH Structure. This is the material that describes the PRACH in the most detailed level I have ever read. Just as a brief conclusion for cell size, we can rewrite the table as follows. Note 4 : Cell Radius is roughly the distance that the electromatic wave can travel during the guard time and devided by 2. In case of free space(in vacumm) it is roughly is 300 (km/ms) x Guard Time (ms) / 2. How UE know which Preamble format it has to use when it generate PRACH and trnasmit ? It is determined by following table. As you see, PRACH Configuration Index determines the Preamble Format to be used. For example, if PRACH Configuration Index is 10 as shown in the following example, the preamble format 0 is used. The you may ask 'Who determines PRACH Configuration index ?'. The answer is 'eNB determines it via prach-Configindex IE in SIB2'. Refer to prach-ConfigIndex section for the details. It is simple. Network knows when UE will send the RACH even before UE sends it because Network tells UE when the UE is supposed to transmit the RACH. (If UE fails to decode properly the network information about the RACH, Network will fail to detect it even though UE sends RACH). Following section will describe network informaton on RACH. Which RRC Message contains RACH Configuration ? It is in SIB2 and you can find the details in 3GPP 36.331. Theoretically 64 PRACH preambles are available in total, but the number of the preambles available in a specific condition (e.g, in a certain cell, whether it is for attach or for handover etc) are determined by a couple of SIB2 parameters as shown below. There are two groups of RA-Preambles, Group A and Group B. Group A always exists and Group B exists only with the specific configuration in SIB 2 parameter. The determination of Group A and Group B is described in 36.321 5.1.1 Random Access Procedure initialization as follows. If sizeOfRA-PreamblesGroupA is equal to numberOfRA-Preambles then there is no Random Access Preambles group B. The preambles in Random Access Preamble group A are the preambles (0 to sizeOfRAPreamblesGroupA � 1) and, if it exists, the preambles in Random Access Preamble group B are (the preambles sizeOfRA-PreamblesGroupA to numberOfRA-Preambles � 1) from the set of 64 preambles as defined in 36.211. As described above, the maximum number of PRACH Sequence a UE can use in a cell is 64. How these 64 different types of PRACH Sequence can be generated ? The procedure is as follows. ii) Generate 64 different sequency by doing cyclic shift of the base sequence. The cyclic shift interval is determined by Ncs and the Ncs is determined by zeroCorrelationZoneConfig and Highspeedflag. Let's suppose SIB2 broadcast the parameters as follows. From a), you will get the base Zaddoff-Chu sequence with u = 1 (Refer to rootSequenceIndex section if you want to know how this number is derived). From b) and c), you will get the Ncs (Cyclicshift interval) = 26 (Refer to zeroCorrelationZoneConfig and Highspeedflag. section if you want to know how this number is derived). Now you can get the 64 different PRACH sequence as follows. One sub carrier of PRACH Preamble is 1.25 Khz whereas 1 sub carrier of UL subframe is 15 Khz. It means that 12 preamble sub carrier is amount to 1 UL Subframe subcarrier. You don't have to know the details of this procedure unless you are the DSP or FPGA engineer implementing LTE PHY. Just as a common sense about LTE, let's know that PRACH is a kind of ZaddOff Chu Sequence generated by the following equation. Be aware that this sequence is allocated along Frequency Domain. UE can select a logical root sequence based on RachRootSequenceIndex. Once UE pick a specific Logical Root Sequence Index value, it can figure out the physical root sequence index (u) based on Table 5.7.2-4. Nzc indicate 'number of data in the ZaddOff Chu Sequence'. This number is fixed to be 839 in preamble format 1,2,3 and 139 in preamble format 4. There are 64 preambles available for each cell and UE has to be able to generate the 64 preambles for the cell it want to camp on. You can easily generate 64 different preambles just by cyclically shifting an existing sequence, but there is a condition for this. All the preamle sequences should be othogonal to each other. Otherwise, various preambles from multiple UEs within the same cell can interfere each other. So we have to shift the generated sequence by a specifically designed value and this value is called Cv (Cyclic Shift Value) and it is defined as follows. (I think determining the Cv is one of the most complicated process in PRACH preamble generation because it gets involved with so many different parameters in cascading manner). First, you would notice that we use different process to calculate Cv depending on whether we use 'unrestricted sets' or 'restricted sets'. This decision is made by 'Highspeedflag' information elements in SIB2. If Highspeedflag is set to be TRUE, we have to use 'restricted sets' and if Highspeedflag is false, we have to use 'unrestricted sets'. N_cs is specified by zeroCorrelationZoneConfig information elements in SIB2. As you see in this mapping, N_cs values also gets different depending on whether we use 'restricted sets' or 'unrestricted sets'. If the Preamble is using the unrestricted sets, it is pretty simple. You only have to know Nzc, Ncs to figure out Cv. The problem is when the Preamble is using the 'restricted sets'. As you see the equation above, you need to know the following 4 values to figure out Cv in 'restricted sets'. The problem is that the calculation of these four variable is very complicated as shown below. You would noticed that you need another value to calculate to determine which of the three case we have to use. It is du. So we need another process to determine du. We went through a complicated procedure just to determin one number (Cv). Once we get Cv, we can generate multiple preambles using the following function. Anyway, now we got a PRACH Preamble sequence in hand, but this is not all. In order to transmit this data. We have to convert this data into a time domain sequence and this conversion is done by the following process. Once the frequency domain Zaddoff Chu sequence is obtained as described above, you can plug it into the following equation and with some additional parameters you can generate the time domain PRACH sequence. Note : For the whole PRACH generation procedure, please refer to 5.7.2/5.7.3 of TS 36.211. We all knows that Network should transmit RACH Response after it recieved RACH Preamble from UE, but do we know exactly when, in exactly which subframe, the network should transmit the RACH Response ? The following is what 3GPP 36.321 (section 5.1.4) describes. Once the Random Access Preamble is transmitted and regardless of the possible occurrence of a measurement gap, the UE shall monitor the PDCCH for Random Access Response(s) identified by the RA-RNTI defined below, in the RA Response window which starts at the subframe that contains the end of the preamble transmission  plus three subframes and has length ra-ResponseWindowSize subframes. It means the earliest time when the network can transmit the RACH response is 3 subframe later from the end of RACH Preamble. Then what is the latest time when the network can transmit it ? It is determined by ra-ResponseWindowSize. This window size can be the number between 0 and 10 in the unit of subframes. This means that the maximum time difference between the end of RACH preamble and RACH Response is only 12 subframes (12 ms) which is pretty tight timing requirement. NOTE : In this section, I will describe on PRACH power only for Legacy LTE. The power varies a little for LTE BL/CE (LTE Cat M1) and LTE NB(Cat M2) which will be explained in separate page. Basically PRACH power is determined by OpenLoopPower control algorithm. It would be good idea to read Open Loop and Closed Loop Power Control Page if you are not familiar with the concept. Regardless of the cases, the PRACH Power (P_PRACH) is determined by the following equation. PL stands for Path Loss between eNB Tx antenna and UE Rx Antenna. PREAMBLE_RECEIVED_TARGET_POWER is the PRACH power that eNB expect to recieve. ii) if the calculated value is less than P_CMAX(23 dBm), transmit the PRACH at the calculated value. Now let's think of how "PREAMBLE_RECEIVED_TARGET_POWER + PL" is calculated. This calculation varies depending on cases asdescribed below. First let's see how PREAMBLE_RECEIVED_TARGET_POWER. This is calculated as follows. Now you would ask on how to figure out preambleInitialReceivedTargetPower and powerRampingStep. These are infromed to UE in SIB2 as shown below. You would still find one unknown parameter called DELTA_PREAMBLE. It is determined by which Preamble Format is used as shown below. Now you may ask how Preamble Format is determined. It is determined by prach-Configindex in SIB2. Now let's think of how UE can estimate the path loss between eNB Tx antenna and UE Rx antenna. Technically it is simple. It can be calculated as follows. UE has 'UE Reciever Power' by direct measurement. The problem is how UE can figure out eNB transmitter Power. It is not possible for UE to figure this out direct measurement. eNB should tell UE of its transmitted power. This eNB Tx power is notifed by a SIB2 parameter referenceSignalPower as shown below. Let's take an example case and apply all the stuffs described above. Let's assume that UE decoded following SIB parameters. prach-ConfigIndex: 3 ==> You can figure out that PREAMBLE FORMAT is Format 0. Now assume that UE measures RSRP at its reciever antenna as follows. Now you can calculate the PathLoss as below. Then just plug these into PRACH power equation and you get the result as follows. This parameter determines what type of preamble format should be used and at which system frame and subframe UE can transmit PRACH Preamble. The meaning of prach-ConfigIndex is defined by the following table. If you are not familiar with how to interpret this table. Refer to the section Exactly when and Where a UE transmit RACH ? zeroCorrelationZoneConfig and Highspeedflg Ie is to specify the cyclic shift intervals to generate 64 PRACH Sequence from a single base sequence. These IE(information elements) are specified in SIB2 as in the example below. 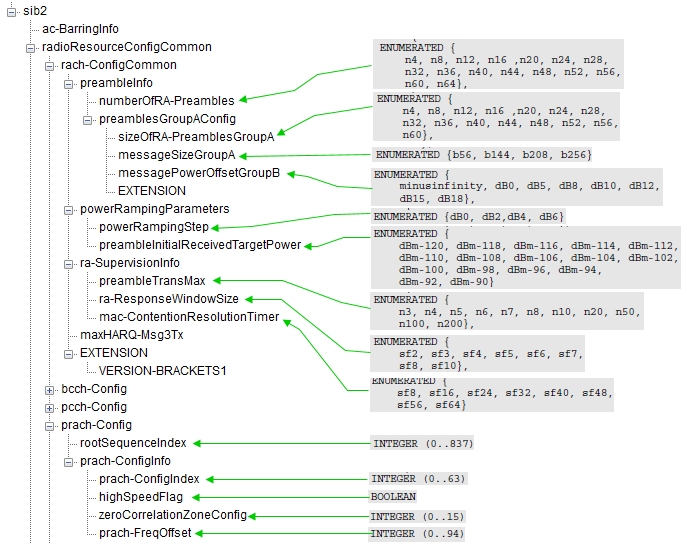 NOTE : If you want to check on which spec defines the mapping between highSpeedFlag and Ncs value set, see 36.331. It states as follows. 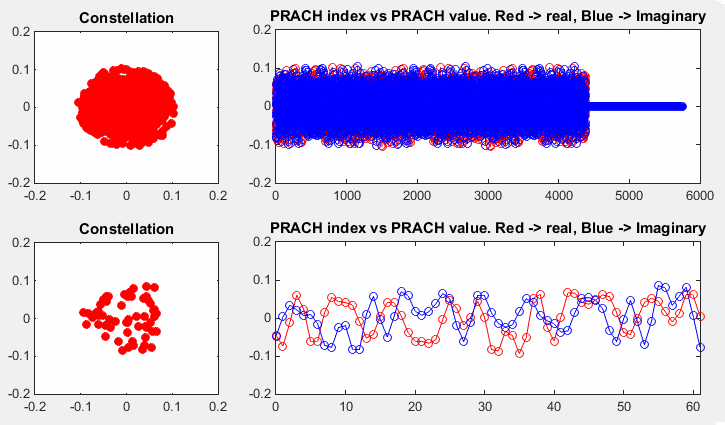 prach-FreqOffset is the parameter that determines the location of PRACH preamble in frequency domain. This location in frequency domain is calculated in the unit of PRM index and calulcated by following equation. As you see, the equation gets different depending on Preamble Format. there are 838 root Zadoff-Chu sequences available for preambles. The length of each root sequence is 839. RootConfigurationIndex informs the UE on which sequence to use via SIB2 as shown below. This rootSequenceIndex is a logical value. The real number (physical number) is called 'u' which is a variable used to generate PRACH ZaddOff-Chu Sequence. The mapping between the rootsequenceIndex and 'u' is determined by the following table. 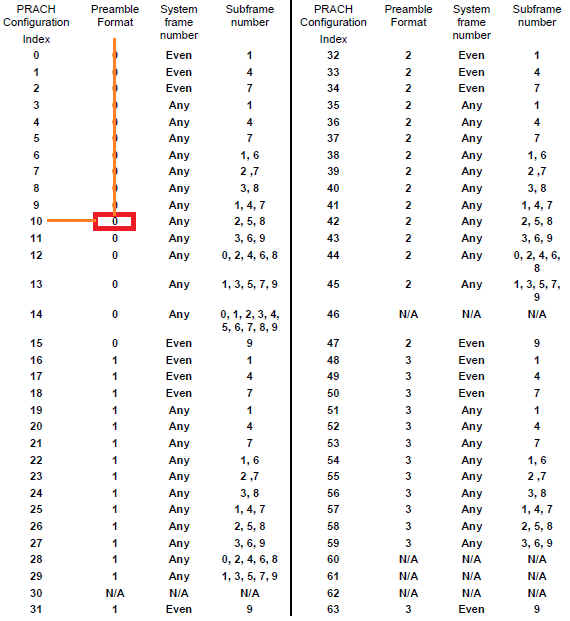 For example, if the rootsequenceIndex is 22 as in the example shown above, the 'u' become '1' according to this table. You may wonder how the 'rootsequenceIndex = 22' is translated to 'u = 1'. It is simple. From the Table 5.7.2-4, you can pick the Logical root sequence number range that the rootsequenceIndex belong to. For example, the range that 22 belong to is as follows. Then you can convert the above row into a table as shown below and you can easily figure out the 'roolSequenceIndex=22' is mapped to 'u=1'. Just for another practice, let me give you another example. What would be the 'u' for the rootSequenceIndex=696 ? 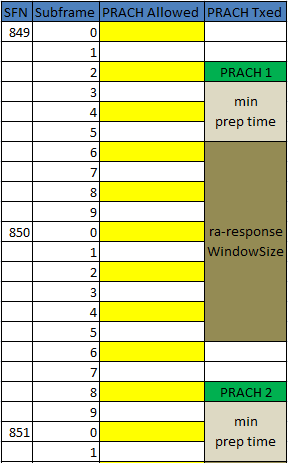 Then you can convert the above row into a table as shown below and you can easily figure out the 'rootSequenceIndex=606' is mapped to 'u=344'. Follwing is an example of RACH procedure which happens during the initiail registration. If you will be an engineer who is working on protocol stack development or test case development, you should be very familiar with all the details of this process. Again, we have to know every details of every step without missing anything to be a developer, but of course it is not easy to understand everything at a single shot. So, let's start with something the most important part, which I think is the details of RACH response. Following diagram shows one example of RACH Response with 5 Mhz bandwidth. We don't have to memorize the detailed value itself but should be familiar with the data format and understand which part of this bit string means what. Let me describe this procedure in verbal form again. �5.1.4 Random Access Response reception" in "TS36.321� says how to calculate RA_RNTI as follows. Where t_id is the index of the first subframe of the specified PRACH (0 <≤ t_id <10), and f_id is the index of the specified PRACH within that subframe, in ascending order of frequency domain (0≤ f_id< 6). For FDD, f_id is fixed as 0. Therefore, RA_RNTI is decided by the sending timing (SubFrame) of PRACH Preamble by UE. It means that (the subframe number (number between 0000~0009) of PRACH transmission + 1) is RA-RNTI. It means that UE specifies RA_RNTI by the sending timing (SubFrame) of PRACH Preamble. Following is an example of Full RACH process with a commercialized LTE device and LTE Network Emulator. I would not explain anything in detail. Just check if the following diagram make any sense to you. If it does, I would say you understand all the details that I explained above. Following is an example of real RACH procedure happening between a UE and Amarisoft OTS. Log shown here is a screencapture of Amarisoft Web Logging tool. Most part of previous section was about the ideal RACH process, which means that UE send PRACH and Network send RACH Response at the first trial and went through all the way to the end of process at the first trial. What if UE does not receive RACH Response at the first trial ? What is UE supposed to do in this case ? The answer is simple. Just retry (resend) PRACH. (In this case, UE might not have any Backoff Indicator value which normally transmitted in MAC CE being sent with RAR). There is another case where UE needs to retry PRACH. It is the case where UE received RAR from the network, but the RAPID is not for it (It means that RAR is not for some other UE). In this case, it is highly probable that a Backoff Indicator value is transmitted with RAR to control the PRACH retransmission timing. ii) Do I have to retransmit the PRACH with the same power as previous one ? Or try with a little bit higher power ? If I have to try with a little bit higher power, how much power do I have to increase ? iii) If I keep failing to receive RACH response, how many time I have to retry ? Do I have to retry until the battery runs out ? or retry only several times and give up ? If I have to give up after a certain amount of retry, exactly how many times do I have to retry ? The answers to all of these questions are provided by the network. The answer (instruction) to question i) is provided by Network via a special RAR MAC PDU called "Backoff Indicator". The answer to question ii) and iii) are provided by Network via SIB2 as follows. powerRampingStep is the answer to question ii) and preambleTransMax is the answer to question iii). In the following example, powerRampingStep = dB2. It means UE has to increase PRACH power by 2 dB everytime it retries. I have explained long about the RACH process. Now you may ask "What is the trigger that let UE initiate the RACH process ?". You will see various triggers in 3GTS 36.300 (10.1.5) : Overall description of RACH Process. "Turning on UE" is one of the trigger for sure. And following is another trigger for this process. This is basically the same sequence that I explained in previous sections, but I simplified the diagram in previous sections to let reader focused more on messaging part of RACH procedure. In this diagram, you see some additional steps like HARQ ACK, DCI 0 (UL Grant). This flow is more similar to real live network procedure. Fl = 3 (First Byte of the Data Field does not corresponds to the first byte of a RLC SDU. Refer to PDCCH Order page for the details of RACH Triggered by PDCCH Order. I wrote a separate page because there are pretty much details on PDCCH Order itself. This section would be the one you can apply all the knowledge of PRACH parameters you have learned. As any other theories in the text book, it is not always easy to digest and apply those parameters in real life cell design and parameter optimization. To be honest, I don't have any personal experience of applying those parameters in real life cell design and parameter optimization. Especially for this section, I got valuable advise from an expert (Jared Cho) and used his comments as a skelleton and I will keep adding as I learn more. Also, I am waiting for the comments/advise from the readers who has experiences/experties in this subject. My approach is to set a few extreme situations and identify what would be the dominant factors (parameters) in those situation. Following is several extreme cases that I could think of as of now (probably add more). First think of what kind of RACH parameters will be the dominant factors for each of these cases on your own. In Case < C > which is the case where High Speed Training model can apply. In this case, both UE and eNB can experience a large doppler shift (expecially when the train just passes eNB). In this case, turning on 'HighSpeedFlag' (i.e, HighSpeedFlag = True) would be important and selecting proper N_CS value depending on situation would be important. Since the doppler shift is a determining factors of parameter optimization, you may easily understand that not only the speed of the motion but also the carrier frequency will play the important role. 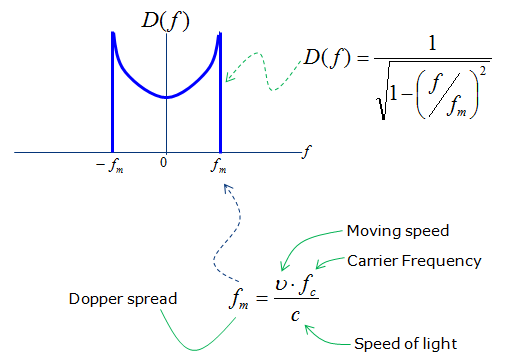 As you know, Doppler shift is determined by both moving speed and Carrier Frequency as shown below. Then you may ask exactly 'Is there any clear cut borderline between HighSpeedFlag=True and HighSpeedFlag=False in terms of Doppler Spread value ?'. I haven't found any document clearly defining on this. However, once you specify a certain doppler shift value as a borderline and you have a specific carrier frequency, you can easily figure out the speed limit for enabling/disabling the HighSpeedFlag. For example, if you set the doppler spread of 200 Hz as the border line, you can determine the speed limit as follows. Now let's see an example showing the configuration of other PRACH parameters which is applicable in live network cell planning. I don't have personall experience with live network cell planning and Jared Cho happily contributed his experties here as well. First you would notice that all the cells has same PRACH config Index. Are these required to be same ? No, you configure them differently depending on situation. If you set them differently (especially in such a way that each of the cells receive PRACH at different subframes), it would be helpful to reduce any possible interference caused by PRACH for other cell. However, in this case a PRACH in one cell can cause interference to PUSCH in other cells. Second ZeroCorrelationZoneConfig is set to be same in this case. These are not required to be the same either. In this example, we assume that the radius of every cell is almost same. Considering that Preamble Format 0 has roughly 14 km, ZeroCorrelationZoneConfig is set to be 12 to match the coverage and Root Sequence Index for each cell is set with a certain interval (the interval of 10 in this case). Lastly prach-FrequencyOffset is set to be 4. This can be set as any possible value, but it is recommended that PRACH would not cause any interference with the location of PUCCH. 3GTS 36.300 (10.1.5) : Overall description of RACH Process. Read this first. 3GTS 36.211 (5.7) : RRC Messages and IE (Information Elements) which are involved in RACH process. 3GTS 36.213 (6) : MAC Layer Procedure related to RACH Process.